If you haven't adopted either match or traditional grip yet, don't waste your time with traditional grip, learn and stick with match grip. Match grip is more natural and you'll have an easier time building great chops. Traditional grip was invented for a marching snare drummer to compensate for the extreme angle of the snare drum when carrying it with a strap. Although traditional grip is "cool", match grip is a superior grip. You can always learn traditional later. Personal Note: Personally I started with both traditional and match grips right from the beginning and have stuck with both. I drum about half with traditional grip and half with match grip. Why? The sole reason is that traditional grip is cool. No other reason. When I play jazz, a very-cool genre, I actually prefer traditional grip. When I play rock, a powerful genre, I prefer match grip. Although much has been written about match versus traditional grip and a debate continues, it's really a simple issue. There is NO debate as to which is stronger and has more endurance. Although you can build up your traditional grip speed, strength, and endurance, match grip is ALWAYS easier learn. With match grip, you hold both sticks the same. Focal point is either the pointing finger (orchestral grip) or middle finger (marching grip). Tilt your wrist down a bit (pinky lower than thumb). With a traditional grip, your right hand is the same as explained above but the left hand uses a different grip to easily increase the stick angle. Focal point is between thumb and pointing finger. Stick rests on tip of ring finger (center of first digit). If you already know traditional grip, it's perfectly okay to use your traditional grip however you feel. If you already know match grip and want to learn traditional, go ahead but don't "pretend" it's better. It's just not. Building Chops - Do most exercises using both traditional and match grips and frequently lead with your left stick. Playing Rock - I use both but prefer match grip because rock is a power genre. Playing Jazz - I prefer traditional grip because jazz is cool and traditional grip is cool. For me, traditional grip feels more "jazzy" than match grip probably because that's what I used when I first started playing jazz. Percussion instruments - When playing misc. percussion instruments with drum sticks, I almost always use match grip. 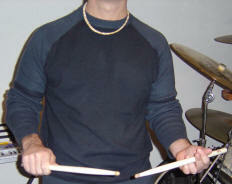 Playing two handed hi-hat beats with a traditional grip is slightly more comfortable than with a match grip. This is because traditional grip allows you to drop your elbow down more than match grip (the angle of the hi-hat and your position on the drum stool effect comfort as well). This is a minor consideration but if you know both traditional and match grip, consider using traditional grip when playing hi-hat grooves. "Play-drums: Drum Traditional Grip versus Match Grip"